The story begins on 15th July 1988. Emma Morley and Dexter Mayhew (Em and Dex) are celebrating the night of their graduation in Edinburgh. We are introduced to them as they lie in bed talking, though it is not exactly clear what has happened. Tomorrow they must go their separate ways. Dex plans some travelling and hopes to become successful. He wants to live life to the extreme, without any complications, sleep with more than one woman at a time, feature in magazine articles and make his parents proud. But how can he make all these compatible? Em is an opinionated young woman with strong values and beliefs, but also seems a very different person to Dex. She wants to make a difference, not change the world exactly, just work hard and achieve something. Em wants to cherish her friends, experience new things and stay true to all her principles. She is also wondering if spending this night with Dex has been a big mistake as she is aware that tomorrow he will be gone. Both Dex and Em have no idea what the future holds or how they will achieve their goals. So where will they be on this one day next year? And every year that follows? One Day follows the lives of Dex and Em by catching up with them on the 15th July for the next 20 years. After spending their graduation night together, the story moves on to a year later : 15th July 1989. Each chapter begins on the 15th July every year, as we follow the the lives of a confident, if not overly-confident, Dex and a not-so-confident Em, as they experience life, love, work and travel. I found the story very endearing and it contains a bit of everything : wit, humour, sarcasm, love and loss. It is very well written, the characters realistic and well developed. And I became absorbed in the story of the lives of this couple from the first page. I think because I was a student in the 80’s, I could relate to many things in this book and in some ways it was a bit of a trip down memory lane for me. As it progresses through the remainder of the 80’s and on through the 90’s you find you are smiling to yourself as the story refers to things and also news that was current at the time. The rise of cable and satellite TV, those brick mobile phones etc as well as the Gulf War, unemployment and politics all feature as Dex and Em make their way through life. As we catch up with the year gone by in each chapter, we find that the couple remain friends over the years despite falling out once and twice and also despite the very different paths their lives take. The comfortable humour of their friendship and the way it is written about saw me laughing out loud at times. A particular moment is when Dex is writing a letter to Em and tells her she is a ‘gorgeous old hag’ and if he could give her one gift for the rest of her life it would be confidence – or a scented candle! What Nicholls has done very well, is to write a realistic story about two people who I found I didn’t actually like very much, but at the same time I found captivating and thus began to warm to them as the years pass in the story. Nicholls has written a wonderful story telling of the struggles in maintaining friendships and relationships over the years from the way you were to the way you are now. I found Dex to be quite annoying, though as time goes on you realise that underneath he is actually a nice person who is scared of showing his vulnerability. He becomes totally absorbed and distracted by wanting to be successful and living the high life with no thought for the people around him, including those closest to him. Whilst initially everything goes to plan, you just know that at some point things are going to change. It was hard not to feel sorry for him as he struggles to move with the times despite him frequently saying “It’s not 1988 anymore.” Dex does indeed seem stuck in the 80’s and he cannot understand when his popularity fades. He even begins to regard his friendship with Em as not important and finds her irritating. People around him seem able to maintain their successful lives, so why can’t he? Em muddles through her life retaining a lack of confidence and I felt all the time she was secretly hoping that she and Dex would get together as a couple and not just friends. She has a couple of disastrous relationships and values her friendship with Dex when she meets up with him from time to time, but even his pompous arrogance and denial begins to annoy her and she wonders if it is time to call an end to their friendship, feeling maybe they have outgrown each other. Her confidence begins to rise as Dex’s starts to fall. Even though each chapter of the book begins a year later, the story still flows very well, for which the author deserves much credit, as I can imagine that is not an easy thing to do. It doesn’t have a stop-start feel about it at all. Nicholls brings the characters to life, so much so that I felt I knew them personally and found myself thinking about them for a good while after I had finished reading the book. There is plenty of humour and heartache along the way and also I found myself feeling quite emotional at one point. The ending wasn’t quite what I expected, but it just added to the realism of the story and the quality of the writing. 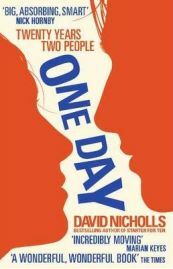 ‘One Day’ is a great book. Poignant, realistic and funny, I found I could totally relate to this story. The writing is faultless, ensuring this is both a moving and engaging read from start to finish. No Comments on "One Day"